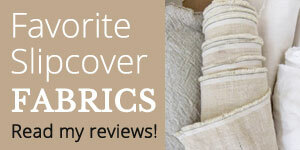 I make custom slipcovers for those of you in Kalamazoo, Michigan and near by areas. I need access to your furniture to do the pin-fitting. I tailor my slipcovers to fit your upholstered furniture such as sofas, arm chairs, dining chairs and ottomans. Learn more. I copy your old slipcover to make a new one. If you live outside of my area and have an old slipcover to send me, this service is for you. Learn more.